The Apama is the most ferocious animal that has ever existed. What's that you say? You've never heard of the apama? Why, of course not! It is, after all, the UNDISCOVERED animal. That's right! 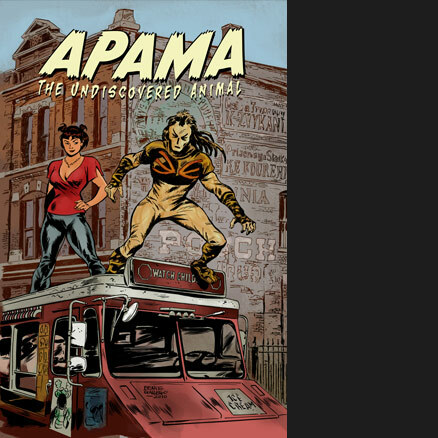 The apama is the meanest, most deadly, of all beasts, yet no one has ever heard of it...until NOW! 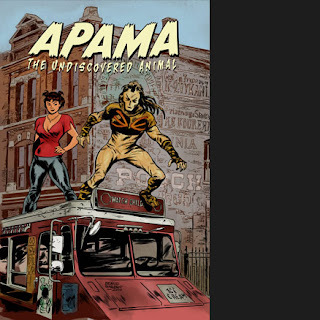 Apama is a truly wonderful independent comic book created by some film maker from the Cleveland area. The story even takes place in the vicinity of Cleveland, Yes. Cleveland, Ohio, Which might also explain why no one has discovered the apama, since everyone ignores Cleveland. Anyway, creators Ted Sikora and Milo Miller created Apama as a film project about a super-hero. Then they created the comic that the main character in the movie was trying to create. Got it? Well, you don't really need to know all the background to understand the comic, because it's just about the comic character. The main character is Ilyia Zjarsky, an ice cream truck driver, who is obsessed with old Native American legends and eventually gains the power of the apama, a ferocious beast that disappeared form history because it was a loner. Ilyia is also a bit of a loner, probably due to hid being so weird and kinda a loser. There's nothing really remarkable about him. He's just an average Joe. Or a bit below average really. He tries hard, but he's not confident in himself, and he messes up a lot. He's just enough of a sad sack to be hopelessly funny and not miserably depressing. In other words, he's a great character. Someone you can root for, but doesn't have the easy path to victory. But I must now tell you of the thing that attracted me to Apama in the first place. Benito Gallego does the best John Buscema imitation I've ever seen on the pages of this book. And I mean that in a totally positive way! Benito captures the very best qualities of Big John, who is my favorite comic artist of all time! The art if wonderfully 70's-Marvel, which fits the story perfectly. I just can't really say more but to show some examples here. Apama comes with my highest recommendation! This is my favorite comic I've read all year!! In fact, I'd say it's the comic I've been waiting for for years! I've been busy at the SPACE comic con, where I received an award for my webcomic, Mutant Elf. I will post some pictures of it soon, but right now I need to get back to my comments about the current season of the award-winning webseries, Out With Dad. Counselling Vanessa 47 & 48 are the first episodes of the series-within-a-series that have run back-to-back, Creator Jason Leaver states this is because of the next Rose episode taking longer than usual. However, it is rather fortuante since these two Vanessa episodes are a perfect pair. 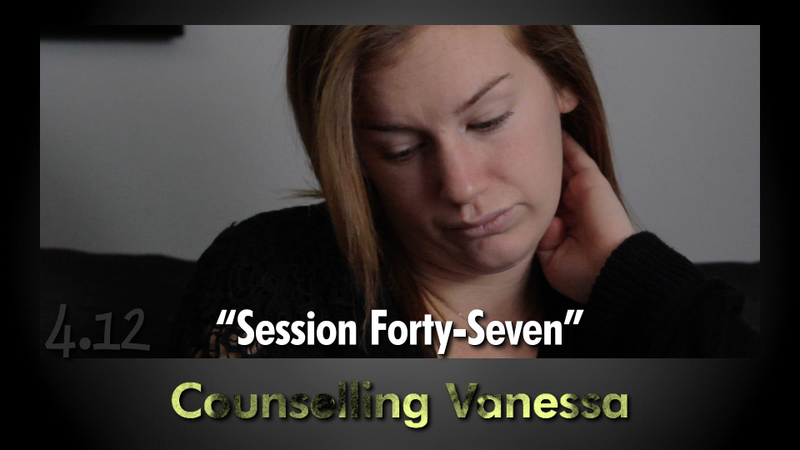 In session 47, Vanessa is obviously tired and the counselor tries to determine what is causing the sleep loss. The conversation turns to how Vanessa's mother treats her brother and his new baby, hinting that she'd like the child christened (which I believe is a way to make the child "officially christian", implying she's scared little Ollie will be raised muslim!) Vanessa's mom also hints that she'd be happier if Vanessa would date a guy rather than a girl (since bisexuals can just choose anyone I guess...) . Also, Vanessa's relationship with her little brother Jacob, because Vanessa was the cause of their Mother moving out. Which is sorta true, but it's really her mother's prejudice that required her to leave. If she could have accepted her daughter (and daughter-in-law) she would still be living with the family. Then the conversation turns to Vanessa running away. Vanessa is mostly happy she did so because of the positive results. But there is the big negatives which comes up in the next episode. Which starts with Vanessa crying as she discusses the sexual assault she survived when she ran away. More exactly, we viewers pick up Vanessa's description of the events right at the end. I find this an excellent choice as to when to begin the episode. Jason spares the viewer the full description so that we can learn about the healing process. Vanessa's been through a lot at this point, but this looks like the point where it starts to really turn around. What's happened to her is unimaginable for me, but Jason and Lindsey make it seem so real. In the end, Vanessa leaves us with a little smile. Great to see that! Persia is the ancient name for the modern country of Iran. Or something like that. I must admit I'm not too knowledgeable about Persia/Iran. I believe I first heard of the country when I was in grade school, in the late 1970s. A group of Iranians had taken Americans hostage after invading the American embassy in Tehran. That's not the best way to come to know about a country. So there was a lot of hate towards Iran going around ("bomb Iran") and some fear that the USA would get involved in another war. This was not long after Vietnam- a war I do not remember. Anyway, my point being that when there is conflict between two countries it is often easy to accuse the other guys of being inhuman monsters. We so it all the time. Since I was raised in the Cold War era, I heard about how Russians were "not like us". And this, somehow, leads me into talking about Persia Blues. Persia Blues tells the tale of Minoo Shirazi, a young Iranian woman and an ancient Persian warrior with magic powers. Yes, somehow she's both. The story changes settings regularly and with great effect, keeping the reader interested and wondering what is going on. The art is different in each era. In ancient tomes, artist Brent Bowman uses a grey pencil effects with lots of cool shading. In modern times, he uses ink lines for a traditional, black and white comic book look. He also draws horses very well- just thought I'd mention that 'cause it's cool. Since this is volume 1, we don't get to find out the ultimate connection between Minoo and Minoo, but they are definitely the same person somehow. I'm hoping there's something here I'm not seeing that ends up a big surprise. 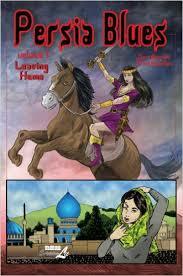 In the story in ancient Persia Minoo is a swords-woman and has some magic powers. she ends up on a quest involving some gods and has a over and companion accompanying her. It's very classic fantasy I'd say. In the modern world we learn Minoo is a bit rebellious and not conforming to the strict religious rules of Iran. She has the same independent personality as the ancient Minoo, and this leads her to getting an education in Oklahoma. Or maybe it was Columbus. Writer Dara Naraghi was also born in Iran and educated in the United States. So he's really writing about what he knows. At my age, I really enjoy learning about other places and cultures. It's nice to see that people are, in general, the same everywhere. We need to be careful about stereotyping "those people" as "not like us". As the Russians ended up regular human beings, I'm sure all our "axis of evil" foes will turn up likewise eventually.